First and foremost, I wanted to apologize for my sudden absence from Four Tines. Marcus and I are safe and fortunately fared well during Hurricane Sandy and its aftermath (my thoughts and prayers go out to those who are still without power and shelter). My bean-counting world was profoundly affected by the storm, so I've been spending every waking hour dealing with that crisis. I'm happy to report that I've reignited my motivation, so I'll be back posting regularly once again. A couple weeks ago, a few days right before the storm hit the island of Manhattan, Linda and I sought some conviviality and maritime fare over at Crave Fishbar in Midtown East after a book signing (more on that later!). The guys over at Immaculate Infatuation raved on and on about the relatively new restaurant, so I made sure I'd report back, too. "Combining an inspired menu with an elegant setting," Crave Fishbar was opened four years after the original Crave Ceviche Bar was destroyed in a tragic crane accident across the street. The restaurant "recalls the spirit of the former restaurant as Chef Todd Mitgang continues to explore creative new ways to prepare seafood with an approachable and sophisticated menu in a vibrant setting." Designed by Nicole Cota Studios, Crave Fishbar has a 60-seat dining space which gives guests "the feeling they're dining in the cabin of a beautiful old ship," especially from "the porthole-shaped mirrors, panels of "weathered, 'wormy chestnut' wood, and woolen plaid booths appear as thought they are from the quarters of the seamen and captains whose portraits are scattered throughout the restaurant." With "a splash of color from deep blue wallpaper decorated with striking patterns of jellyfish and squid" and industrial lighting illuminating the ceilings, the restaurant's décor is comprised of "an eclectic mix of salvaged materials from the original Crave, along with the custom-made chairs and tables by furniture company Recycled Brooklyn" all of which contribute to the rustic feel of the space. The upstairs space, currently a private dining room, will soon serve a raw bar menu. 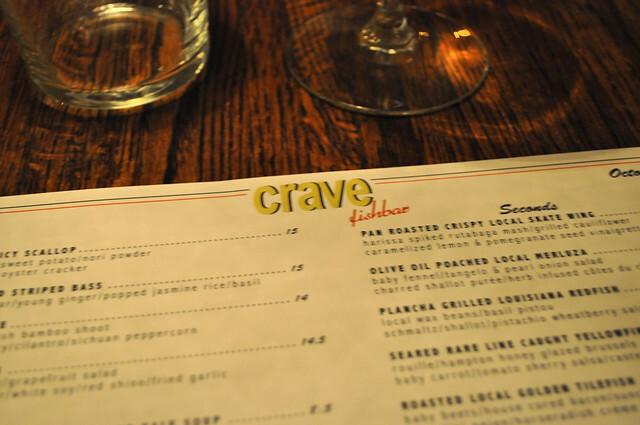 The menu at Crave Fishbar has many of its signature classics from the original location as well as brand new, continually changing menu of exciting seafood preparations. "Appetizers showcase Chef Mitgang's deft approach to raw fish, while main courses take inspiration from cuisines around the world." A selection of pasta and meat dishes round out the menu as well. After graduating from University of Buffalo with a degree in business management, Chef Todd Mitgang enrolled at the French Culinary Institute. He worked as a sous chef (later executive chef) at Ruby Room (now Lisenda), a seafood-driven restaurant in Roslyn Heights, New York. Later on in 2004, he sought a bigger challenge and accepted a position at Kittichai in New York City, where he began as sous chef and later promoted to chef de cuisine shortly after. 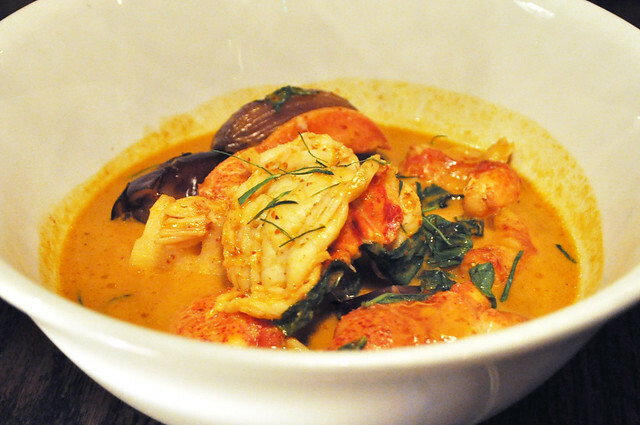 During his time on the line at Kittichai, Chef Mitgang was "introduced to the big, bold flavors of Thai cuisine that would help him develop his distinctive cooking style." When Chef Mitgang wanted to start his own venture, he "turned his attention to a restaurant idea he'd been working on devoted to refined, global ceviche." With business partners Brian Owens and Dino Andreakos, he opened Crave Ceviche Bar in 2007. However, in 2008, the restaurant was tragically destroyed in a crane accident, and as a result, the community "showed its unanimous support for Chef Mitgang and his team, hoping Crave would return to the neighborhood it called home." Fortunately, four years later, Crave Fishbar was opened in 2012, a place for Chef Mitgang "to explore new ways to prepare seafood for his guests to enjoy." I started with something from the Raw menu -- the local spicy scallop with fingerling sweet potato, nori powder, and homemade oyster cracker. There was a lot of awesome things going on with this dish, especially with temperature and texture. The chilliness from the raw, cubed scallops danced playfully with the warm fingerling sweet potatoes, while the moistness from the scallops and potatoes provided an interesting textural contrast with the loose and snappy crunch from the oyster crackers. The nori powdered added another dimension of flavor to it overall, as its seasoning made the ingredients pop in taste. 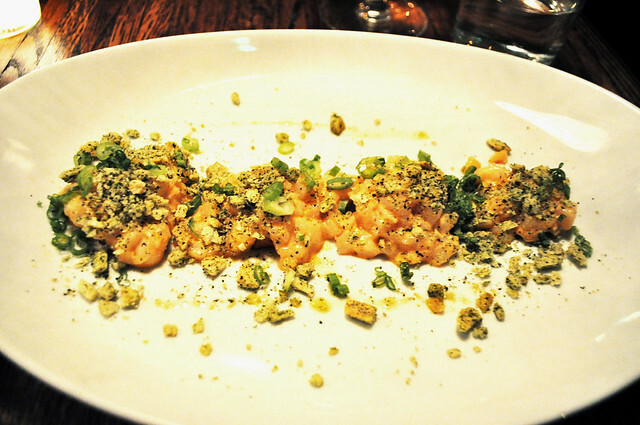 Very noteworthy dish from the Raw menu, for sure -- loved it! Linda had one of the dishes that the staff had continued to rave about to us -- the fresh Florida crab which had olive oil marinated lump crab with heirloom garbanzo purée, sautéed corn, baby zucchini, squash, and lemon-prawn oil. 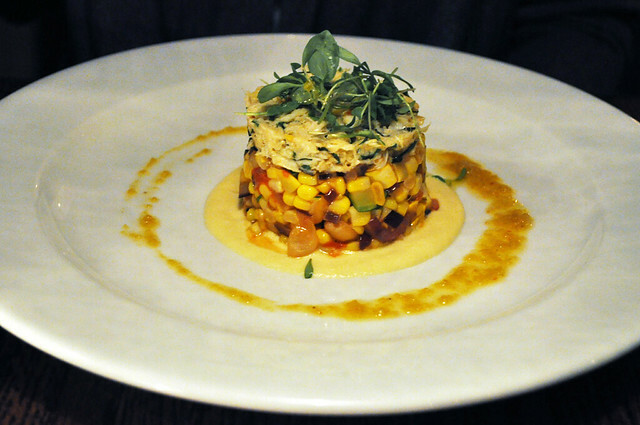 This carefully crafted tower of ingredients had some sweet and plump lumps of crab meat as well as burst full of fresh crisp and smoky medley of vegetables. Don't be fooled by the dish's simplicity -- it really hit this out of the park. Another solid choice to start! 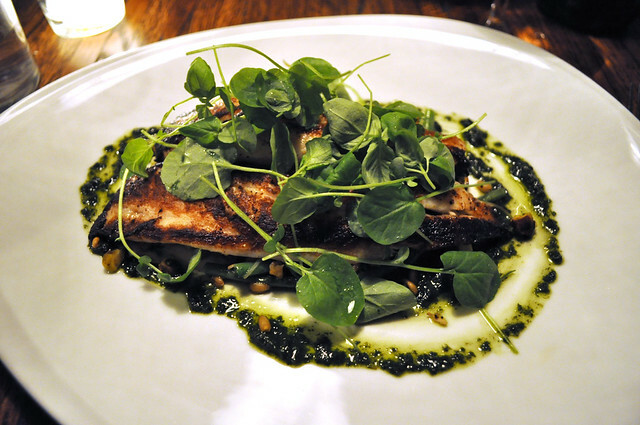 For my main course, I had the plancha grilled Louisiana redfish with local waxbeans, basil pistou, schmaltz, shallot, and pistachio-wheatberry salad. There were so many great choices on the menu, but the pistachio-wheatberry salad is what sold me. The charred exterior of the redfish added a nice crisp, blackened texture to the rest of the wispy flakes of fish. The waxbeans had absorbed the flavor from the shallots and savory from the schmaltz. Even though the preparation of the redfish was pretty simple (i.e., grilled and seared on a metal surface), the accompanying ingredients dressed it up all very nicely, especially the combination between the nuttiness of the pistachios and the graininess of the wheatberries. Linda had the lobster curry with chu-chee curry, charred red onion, Thai apple eggplant, Japanese eggplant, and fresh bamboo shoots. In general, I normally find curry too overpowering for my liking (something about its spices doesn't sit well on my palate), but if food could have a melody, lobster curry was euphonious for me. It was silky on the palate, while its bold, South Asian flavors gave the dish a little edginess. The lobster was juicy and plump with savory eggplant varieties and soft, crunchy bamboo shoots. 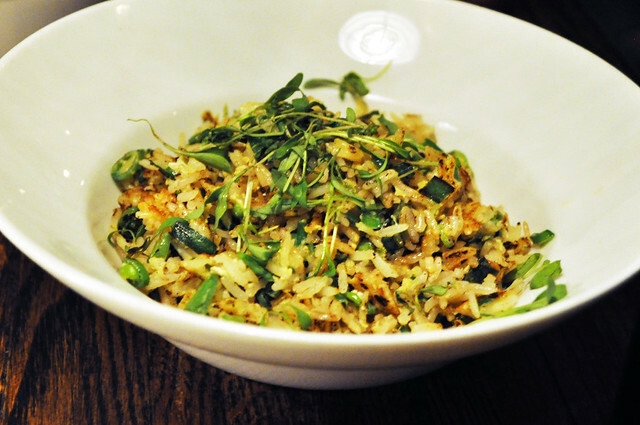 The lobster curry was only complete with a side order of the garlic-chive fried rice with snap peas and fried egg. Biting with aromatic garlic and chives, each grain of rice swept up the creaminess of the curried stew. 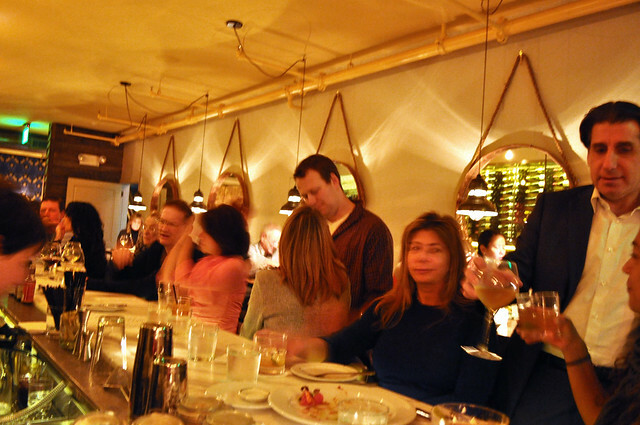 Findings: I am delighted to report that another seafood-focused restaurant has graced the Big Apple -- one that is fabulous all-around and boasts some solid maritime fare without a hitch. I can only count a few places in the city which can single-handedly deliver such an experience that isn't sushi-centric, and I am glad that Crave Fishbar can undoubtedly be a part of that. The relaxed yet knowledgeable staff matched with the talent that bursts through the seams of its kitchen is just the start. The ambiance is as chill as the blues of the walls that emulate the deep blue sea, and the interior design subtly and cleverly emulates the most modern ship cabin without being cheesy. Just be wary that it gets pretty hopping around 7, and even with a reservation, you may not be seated right away (we had an 8:30 reservation and weren't seated until a little before 9). I completely overlooked that blunder (I don't even see it as one! ), mainly because the hostess and the team at Crave Fishbar were so welcoming and accommodating that Linda and I remained as happy as clams hanging around along the bar until they were ready for us. With that being said, reservations are key as walking in during prime dining times will be virtually impossible to finagle. 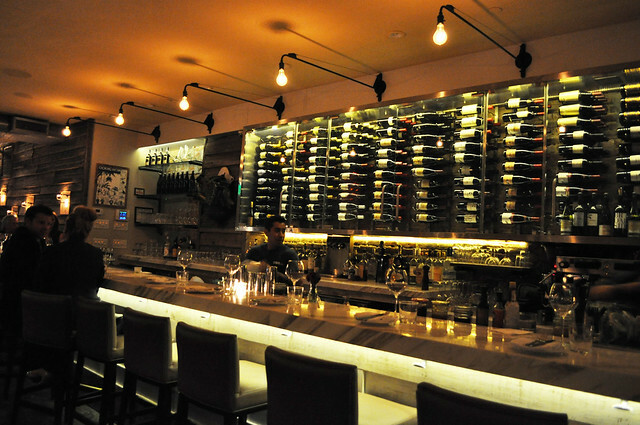 Dining at the bar is also a comfortable option. 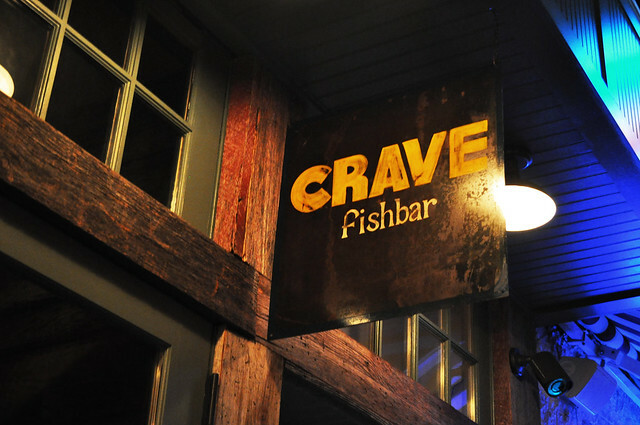 It is nice to know that Crave Fishbar is minutes from the tram (thus essentially around the corner from my humble abode of Roosevelt Island), so that any cravings for seafood will be gratified with Chef Todd Mitgang's well-crafted creations. Price point: $15 for each raw course, $16 for each first course, $27-31 for each entrée, $8 for each second course, $11-14 for each glass of wine.